At a first glance it might seem that axial extension poses are easy – what’s so hard about sitting upright and breathing for a while? But we all know that the challenge here is the subtle work that takes place, as well as being able to maintain the position for some time without muscle fatigue. 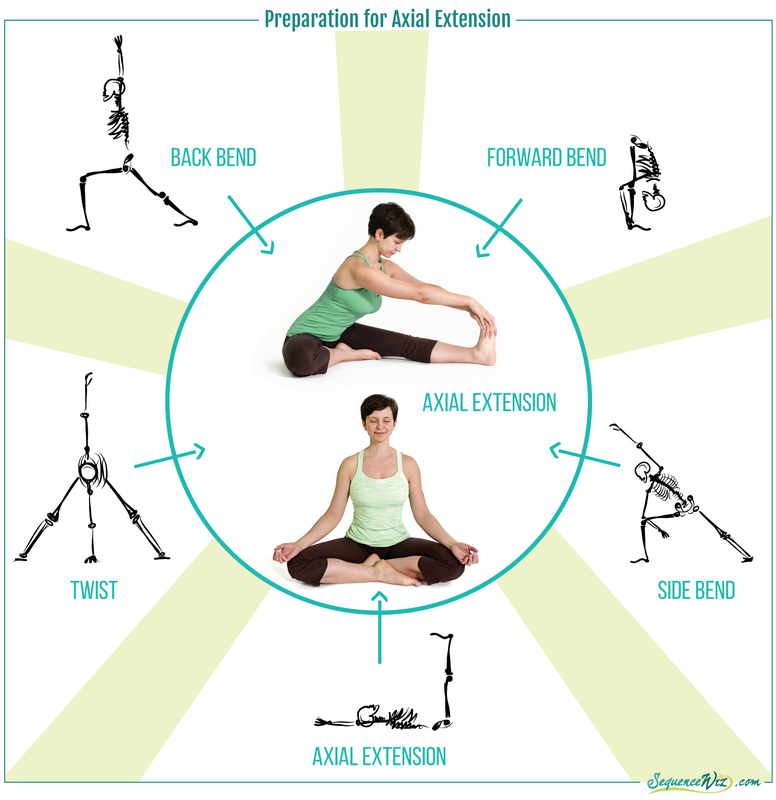 There are two main ways of working with axial extension postures: you can make them the focus of the practice, or you can use them as compensation/transition postures throughout to create a more balanced and safe sequence. Let’s take a closer look at those two options. You can make any extension posture your goal posture and organize the entire practice around preparing for it. I have taught practices where Downward facing dog was a goal posture, or Supine Toe hold, for example. But probably the most obvious choices for the goal posture when it comes to axial extension are Maha Mudra and Easy pose. In viniyoga tradition Maha Mudra is considered a remarkable pose, a quintessential yoga asana, because it combines the elements of all other directional movements of the spine: it is part forward bend (because you are leaning forward), part back bend (because you are pulling the chest away from the navel), part twist (because you are turned toward one leg) and part lateral bend (because one side of the body ends up longer then the other). But the purpose here, of course, is to lengthen the spine, which makes it an axial extension posture. So while working on this one pose you get a chance to embody the essence of every directional movement of the spine AND work on creating an energetic path along the spine. That is why, when done properly, this pose can be very powerful in its ability to integrate different parts of the body and create a sense of stillness and spaciousness. Since this pose contains the elements of all other directional movements of the spine, if we plan to spend some time working on it, we would usually include forward bends, back bends, twists, lateral bends and other axial extension postures in the practice to make sure that we prepare the body adequately. We also need to prepare the neck, hips and legs for this pose. Once we arrive at the pose, we usually take time to explore it, working on the subtleties of body alignment and choosing the breathing practices that support that exploration. When it comes to Easy pose, the focus is slightly different. Here we are more concerned with being able to maintain the position for an extended period of time, so that we could work on breathing and meditation practices. This means that we need to foresee what kind of challenges we might encounter and try to prepare the body to handle them. Here the postural muscles that provide support for the core and the neck are the most important ones. As we discussed earlier, the core muscles wrap the body from the front, side and back like a tight package, which means that to activate them we need to do forward bending, back bending, twisting and lateral bending, as well. So here, again, we usually do poses that touch on every directional movement of the spine. In addition, we usually add arm movements to prepare the neck and some external hip rotation movements to prepare the hips for sitting. That is why we rarely do extended sitting at the beginning of the yoga class – you need to be a very experienced practitioner to be able to stay still, upright and focused without any movement preparation. So to sum it up: if you choose to build your class around an extension posture, you will probably need to include all other directional movements of the spine in your practice to prepare the body properly and to allow a meaningful exploration of the full potential of the axial extension pose. Next time we will talk about using axial extension postures as compensation/transition postures throughout the practice to create a more balanced and safe sequence. I enjoy reading and appreciate your posts, thank you. I have a question about Easy Pose (and other seated postures). I experience lower back pain (usual suspects – twisted pelvis, various unhelpful spinal curvature, SI joint and lumbar/sacral sensitivity, prone to muscle spasms, possible hypermobility/lax ligaments) and sitting for anything beyond a short time period often exacerbates these. The long term solution is no doubt release of chronic tension (especially from the hips) and also opening up the front of the chest, but is there anything you would suggest for now – or just avoid the posture? (I’ve tried supporting my knees with cushions and sitting on blocks so that my hips are at least not below my knees and this can help a bit, but not enough to stop me feeling it in my lower back/SI joint). 2 questions sprang up during reading this post. 1. Can _every_ twist be categorized as lateral bend? In any twist, one side is compressed while the second “ends longer than the other”. 2. Writing of sitting being unsuitable to start a practice with, here as in an earlier article, you speak about SI joint, core musculature – but not the knees. In my mind, the knees will scream first if somebody enters the sitting pose unprepared, even if it is a sukhasana. Aren’t you planning a separate article on _knees_warming_up_? It would be so appreciated! Hi Alaxander! When we classify poses into those categories we do it not just because of how the body is positioned, but also by what it is we are trying to accomplish. Twisting poses and lateral bends move the spine in different ways and have different purposes, although some folks say that most lateral bends have an element of a twist in them because it is rather difficult to bend sideways without any sort of mild spinal rotation. Regardless, I think that classifying poses into groups by intention makes the most sense. As far as knees screaming in sitting postures – this is rather common,but most of the time it happens because of some sort of limitation in the hips. Knees often end up on the receiving end of what’s happening above and below them, so theoretically if we do a good job preparing the hips, it should help the knees. There are exceptions to that, of course, so if somebody’s knees are still bothered by Sukhasana even after extensive preparation they should sit in a chair or some other position that’s more comfortable. And yes, I will be talking about knees specifically very soon! Cheers! Before you piblish the promissed post about the knees, I’d like to specify. No doubt that vast majority of knees’ trauma happens because of an excessive torque applied to the knees, which follows immediately from unsufficient preparation / opening of hips. Never a new explanation can be redundant here! BUT: another reason to focus on knees is the stiffness of a knee “envelope” – joint capsule, ligaments, and sinews (meniscus issue shall be omitted here). Before opening your legs unto sukhasana and alike, the knees must simply be flexed, which is not always simple. Could you elaborate on this topic, too? I.e., on warming up, “opening” of knee joint itself on way first to better vajrasana and only then to crossed-legs seating. I’m in the same tradition as you, and you do a really fantastic stuff of making this stuff accessible. Keep up the great work. The Maha Mudra was a little bit of a ‘mystery’ for me. But this brilliant article has thrown sufficient light and clearled up my doubts. What nature of breath work would you suggest, to maximise the results while in this pose? And why?